Winter is on the way and it is time to put feeders up! Birds are returning to feeders even though there are still many seeds in gardens and fields. I keep my feeders up all year-fall, winter, spring, and summer. I love seeing the different behaviors of the birds throughout the different seasons, especially the young birds in spring and summer. With the cooler weather, birds are visiting in large numbers. In the coming weeks, I will write about the different birds that visit my yard. 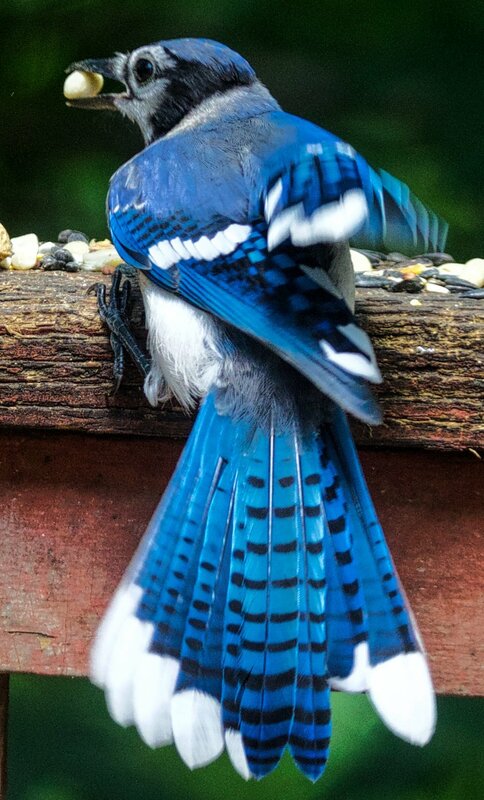 Blue Jays are very common highly adaptable and intelligent bird in my backyard and in yours! They are large noisy, blue birds with blue, white, and black plumage. They have a very loud, boisterous call. Blue Jays often alert other birds when hawks or other predators are near. They can mimic the call of hawks which tells others birds that a hawk is near. They seem to recognize when I am putting seed on the deck and often call the other Jays to eat. 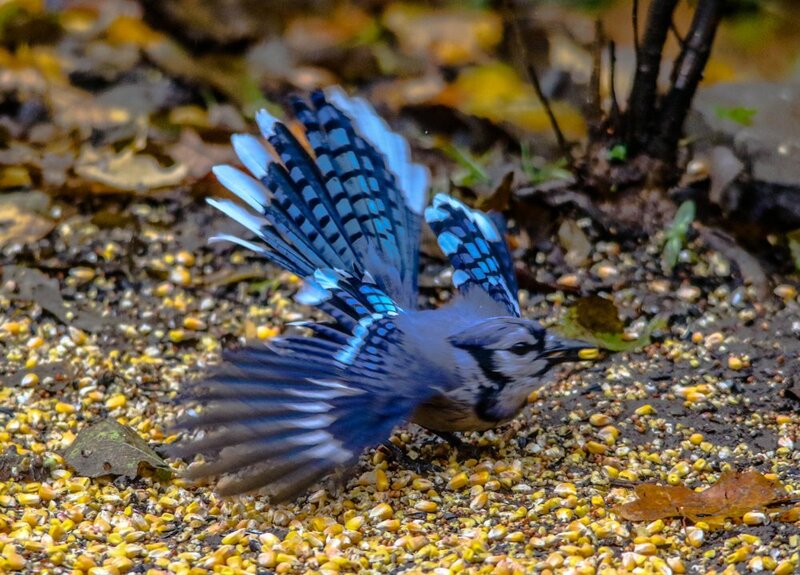 Blue Jays love peanuts and I offer them shelled and unshelled peanuts as well as sunflower seeds and corn. They also enjoy fruit and I have observed them pecking and eating the apples from my apple tree. 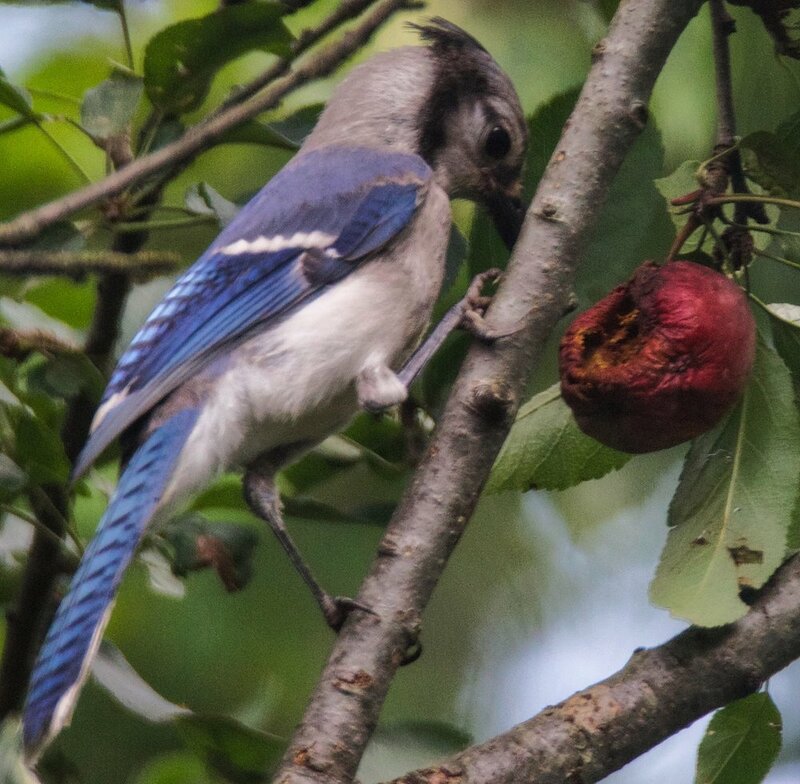 Blue Jays also eat insects and may even raid the nests of other birds. They are also known for eating and spreading acorns increasing the number of oak trees. When eating Blue Jays hold their food between their feet while pecking the food open. They are often putting lots of food in their mouth at the same time storing the food in their throat or gular pouch. They hide the food for another time similar to the way squirrels store their food. Blue Jays like to live in forests near oak and beech trees. They are very social and live in pairs, family groups, or small flocks. They are monogamous and stay together for life. They breed from mid-March to July. Both parents are involved in caring for the hatchings but the mom is the primary caregiver. The oldest wild, banded Blue Jay was at least 26 years, 11 months when it was found dead in 2016. For more information check out the following websites.